I love green mung bean-I find split ones in Indian Grocery Stores all the time (haven’t tried them yet) but love the whole ones. 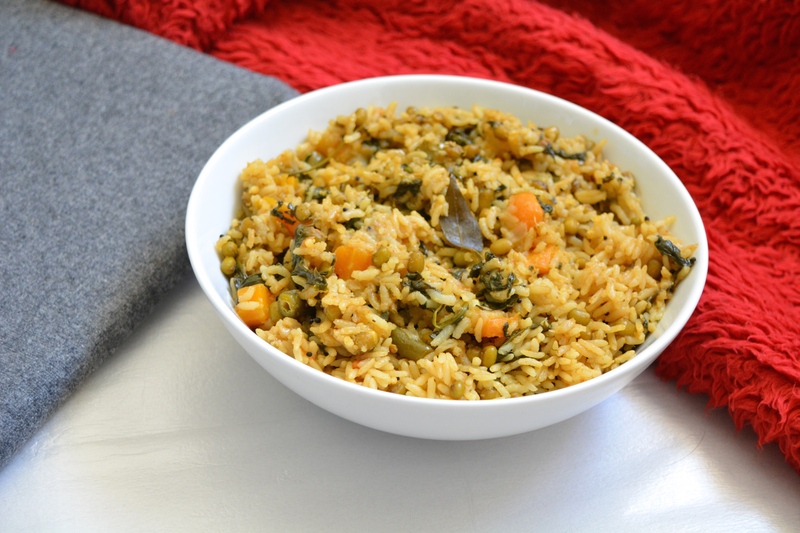 You soak them for 30 mins in hot water and they are ready to go into a pressure cooker and cook to perfection in another 20 mins 🙂 You can make a variety of dishes using these amazing power packed green lentils. 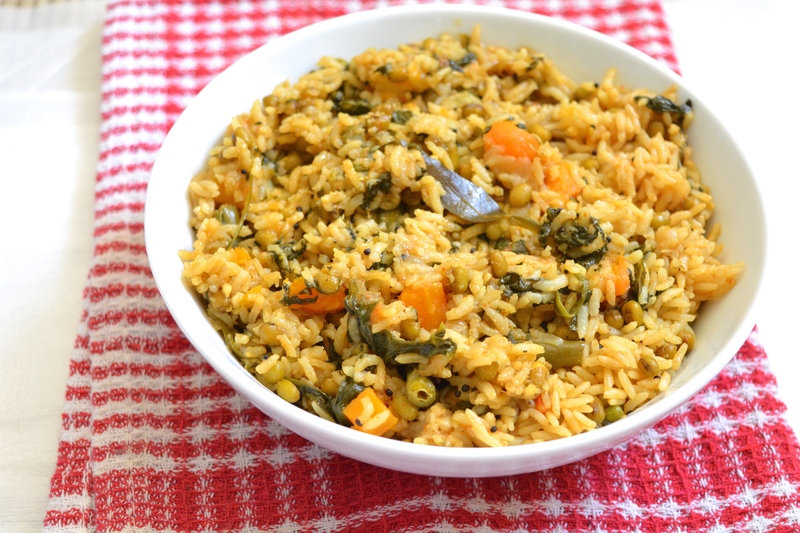 Sanjay’s sister who loves to try new recipes-passed me one of her favorite- a pulav/rice with green gram. I was a bit skeptical to try it at first but decided to try it out. It was something I’ve never tried before. Came out so well. I decided to improvise it. 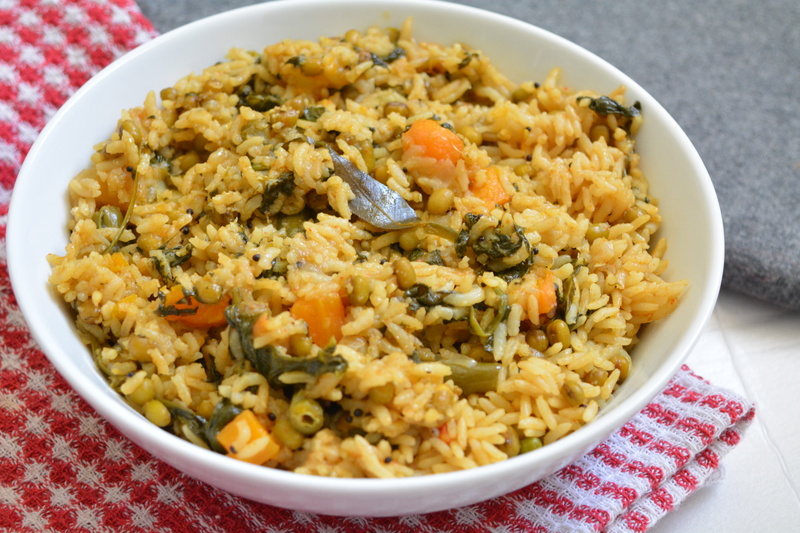 So made this Amazing Khichdi. 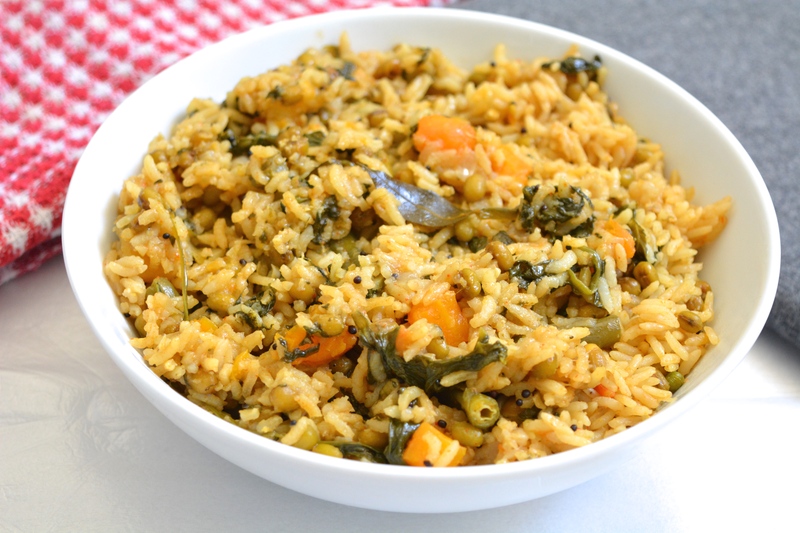 Khichdi translates to ‘lentils and rice cooked together’. It is super super healthy with all possible goodness in there. 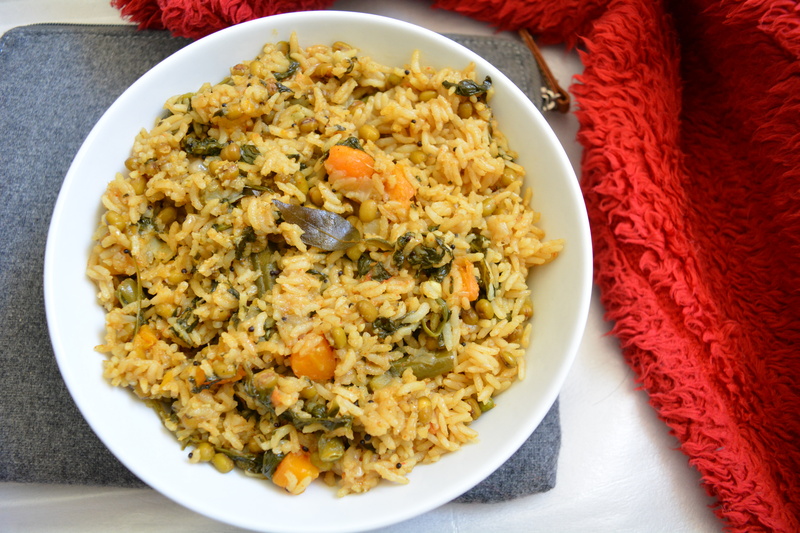 I used green gram and rice, spinach, veges, peas – Can this get better at all? 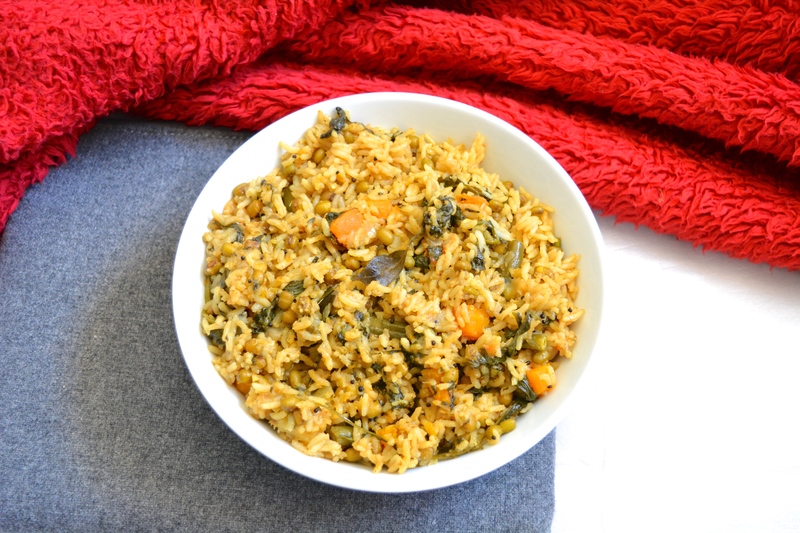 Here you go with the recipe for this Amazing Hearty Healthy Meal. Into a pressure cooker, add coconut oil, heat it up, then add mustard seeds, curry leaves, hing, cloves, cinnamon, bayleaf and let it pop before adding onions, green chili in and fry until translucent. Add grated ginger, garlic and fry until they start to stick to the bottom of the cooker, now add tomatoes in. 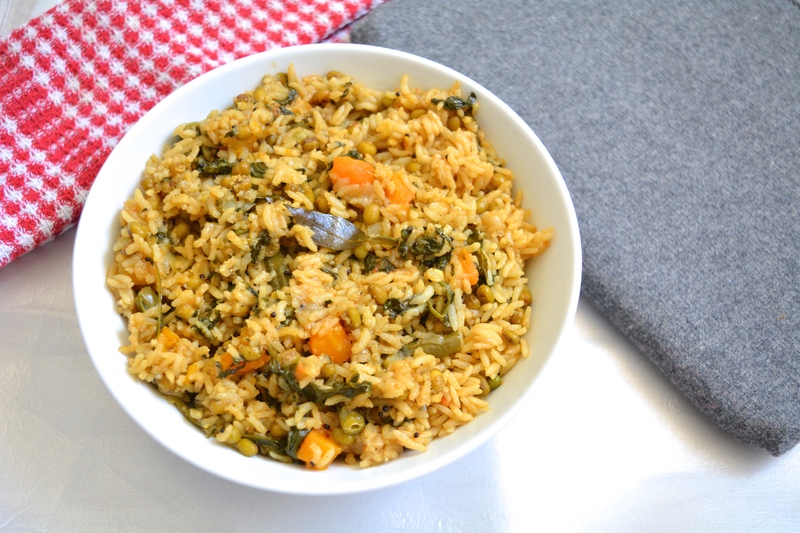 Add all the veges (carrot, potato, spinach, green beans and peas), give it a quick stir, add drained green gram and rice. Mix everything together-add 4.5 cups of water, add salt and stir once again. Wait for the cooker to cool down and open the cooker and give it a quick mix. 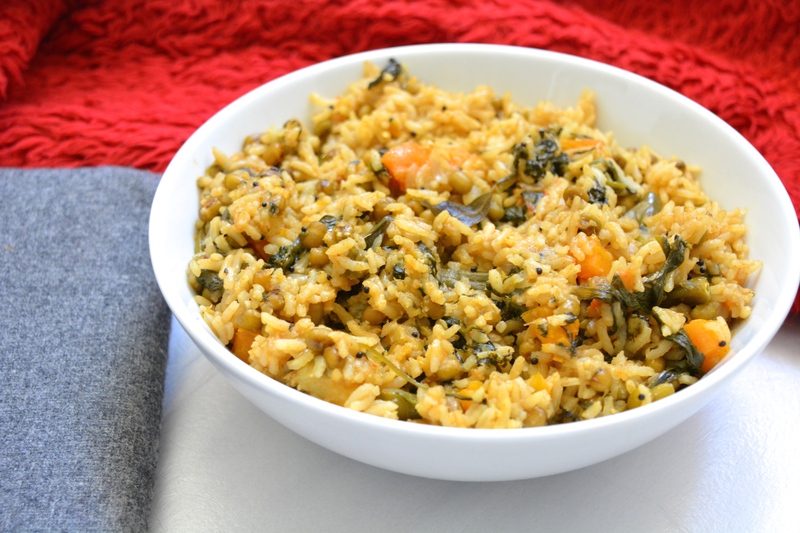 I’ve never tried khichdi with whole green gram. Though we mk it with the split variety. Your recipe is definitely healthier! 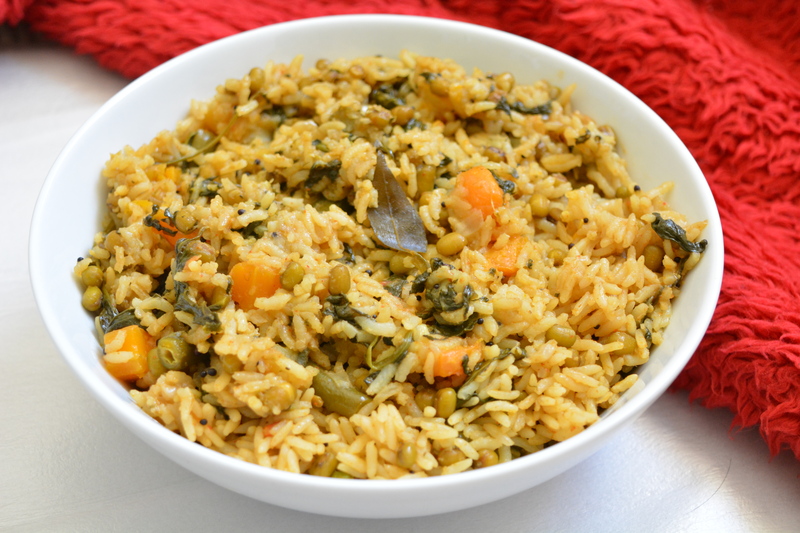 Charu dear very nice to see addition of indian spices in your kitchen…..Green gram khichdi my favourite and looks gorgeous…..slurp.